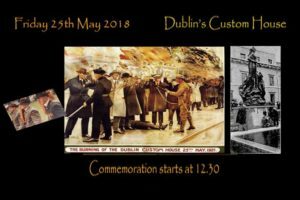 This year’s commemoration will be held as usual at the memorial statue at the Beresford Place entrance of the Custom House at 12.30 on Friday the 25th of May 2018. The small gate at the corner of Memorial Road & Beresford Place will be opened for the event. We will lay the wreaths starting at 12.55 which was the time the men began to enter the building in 1921. The first wreath (in memory of the IRA who fought & died at the Burning) will be laid by Liam Flynn and Marie Therese, relatives of Anthony Flynn the man who drove the truck load with the materials needed to burn the building in 1921. The second wreath (In memory of the civilians that died that day, 2 Custom House workers & 2 passers-by) will be laid by Des White who has put a huge amount of work into researching the Custom House Fire and the men involved for this site and other forums. We will have a piper from the Dublin Fire Brigade as usual in attendance at the wreath laying ceremony. After the ceremony we will go into the conference room of the Custom House for a showing of the photo project. This time gives the attendees of the commemoration a chance to talk & swap stories about burning & it’s aftermath. We would like to invite anybody who would like to come to the commemoration to attend. The event, like this site, is run by ourselves the Custom House Commemoration Group. It’s a non political event & we have no ties to any political party or group whatsoever. We look forward to seeing you all on the 25th of May. Hi Debbie, we’d love to see you at next years event. We always put up a notice both on this site & our Facebook page before the event.